Log Home Caulking: Why Does It Crack and Fail (Part 2)? 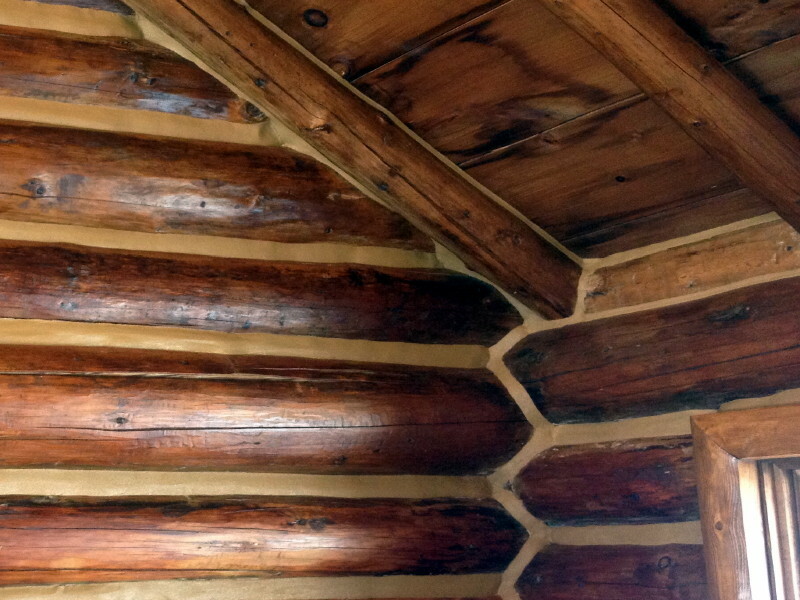 The problem of failing caulk on log homes/cabins was covered in a previous post. In this post, I cover what to do about it. As we know, failing caulk is a bad situation. Sometimes it may have gotten to the point where all the existing caulking needs to be removed. Other times – just a portion of it needs re-caulking. 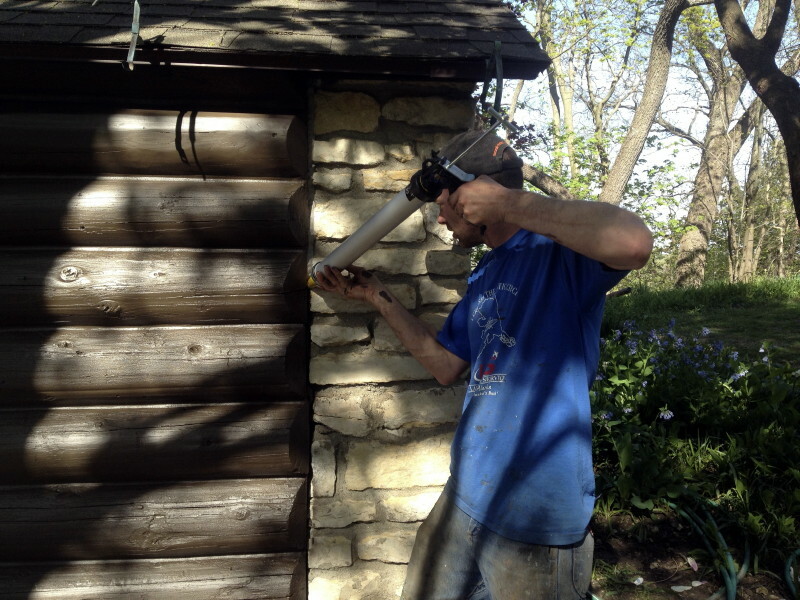 It is important to have a good line of caulking between a log wall and stone corner like this one. Check these types of seams regularly to make sure the caulking maintains a tight seal. If your caulking is falling out and there is no longer a solid seal between the logs, it needs to be removed and another bead of caulk applied. If it’s simply cracked you may be able to go over it with a new bead of sealant. How do you decide if it is necessary to go through the work and expense of removing it? Look at the profile of the line. If the current caulking is sticking way out already, i.e. pushed towards the surface of the outer round of the logs, then going over it is not an option. Time to remove and start over. When chink lines get this wide, it takes skill to make them look smooth and consistent. If the caulking is set into the line, then going over it may be the best choice. In other words, one needs to decide whether or not to remove the old caulking based on the condition of the lines. Sometimes removing the caulking is wasted effort because taking it out simply makes more work because it’s necessary to build the line back out after the existing caulking is removed. If the old caulking is removed, then typically backer rod needs to be installed to form a non-bonding surface again. If you do decide to go over the existing caulking, you may need to use a tape (packaging tape or Tyvek tape) to put against the old line of caulk. The reason for this is to break the bond between the new caulk and the old. This prevents the new caulking from prematurely cracking itself. If you have small gaps between your logs (3/4″ or less) then you may want to consider a product like Energy Seal or Conceal. These are lightly sanded caulks that blend in well with log stains. If you have larger gaps – then “chinking” is in order. Chinking is a more sandy, latex polymer material and does an excellent job of filling gaps over 3/4″ wide and smaller gaps as well. 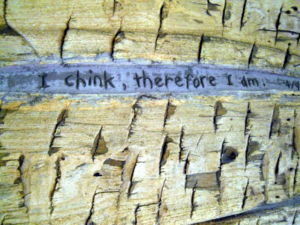 Some “chinking humor” we found between these rough hand-hewn logs. We use a lot of Perma-Chink chinking and we love it! There are other good chinking products out there too. Some are easier to tool out than others, but all have good adhesion properties. If you need help with chinking or caulking your log home, call us at 715-373-5744 or see our chinking and caulking page for more information. Good luck filling those gaps!